A Saatva mattress is built for comfort and luxury while costing a fraction of what you would pay at a traditional mattress retailer. Our Saatva mattress review will help you know if this is the right mattress choice for your needs. 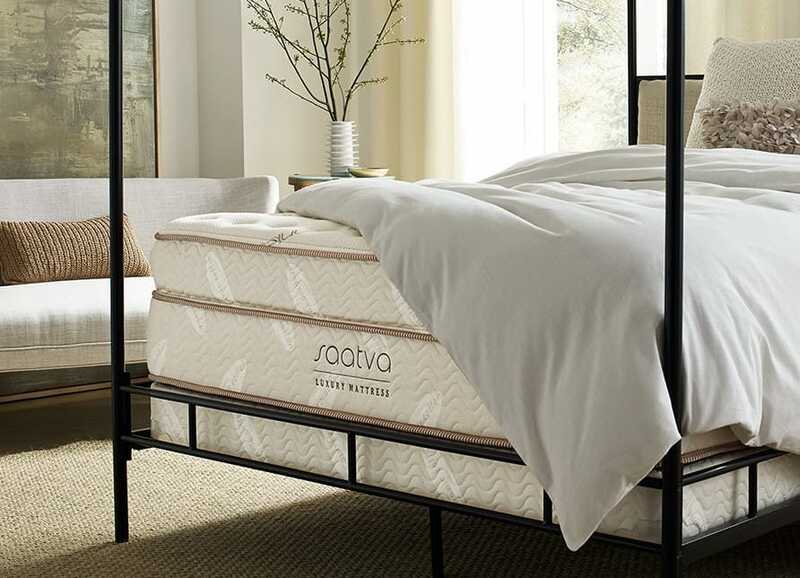 Saatva mattress reviews have a lot of positive things to say about this amazing mattress, and our review is no exception. 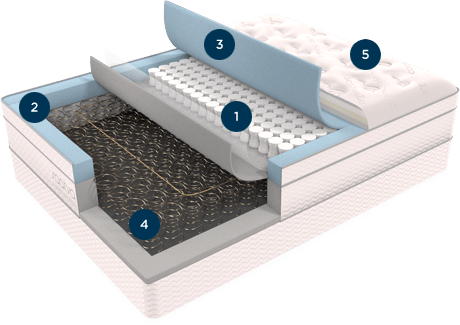 The Saatva mattress is unique in the online mattress category as it has a coil-on-coil construction, while most online retailers offer only foam or hybrid options. Saatva’s lower coil unit provides the support base, and the top coil system features comfort coils. The comfort coils are individually wrapped, which allows them to contour and respond to your body. Similar to a foam mattress, this coil-on-coil system eliminates most motion transfer. That makes this bed perfect for couples, especially if one half of the couple tends to toss and turn. Atop the coil system is a Euro pillowtop for additional comfort. For all of these reasons and more, Saatva is our top choice for Best Overall Mattress. After our Saatva mattress review, we’ve ranked Saatva as the Best Overall Mattress. Here are some of the reasons we fell in love with this mattress. 15-year warranty: Saatva offers a 15-year warranty on its mattresses. If your mattress is deemed defective within the first two years of your ownership, Saatva will replace it at no cost to you. After two years, the policy changes a bit. For the next 3-15 years, the company will recover or repair your mattress but not fully replace it. 120-day sleep trial: Saatva gives you approximately four months to decide whether or not you want to keep your mattress. Should you realize on day 119 that you don’t love your Saatva mattress in spite of the positive Saatva mattress reviews, the company will come and pick it up and refund you in full. Adjustable base: Saatva now offers the Lineal Base, an adjustable base that allows you to move your mattress up, down or flat. This is something that many Saatva mattress reviews rave about, and we’re no exception. 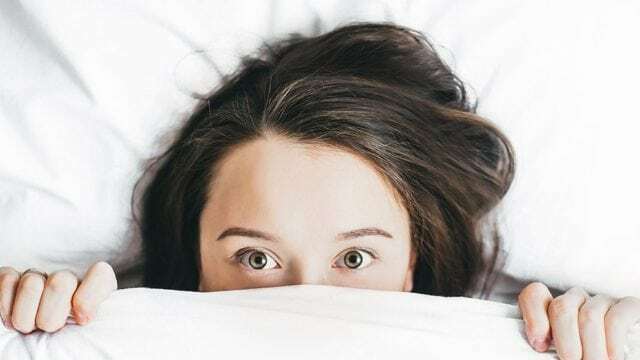 Cooling materials: Are you a hot sleeper? Do you often wake up sweating? If so, Saatva could be the perfect mattress for you. Coil-on-coil and hybrid mattresses are cooler than their foam counterparts. Easy rotating: Due to Saatva’s construction, the mattresses do not need to be flipped. They do, however, need to be rotated at least once a year. While the mattress is heavy, the 14.5″ model comes with handles that make the rotation a breeze. Eco-friendly materials: Saatva mattresses are comprised of 100 percent eco-responsible materials. You can sleep soundly knowing the company is doing its part to reduce waste. Free white glove delivery and mattress removal: Don’t want to unpackage or set up your mattress yourself? Saatva will do it for you! Simply select the optional white glove delivery and the company will take care of the setup. Plus, if you want to get rid of your old mattress, the company will take it away for you. No motion transfer: Saatva’s coil-on-coil construction helps eliminate motion transfer. If you have a partner who tends to move around in their sleep, Saatva will help ensure your side of the bed stays firm and unmoved. Varying degrees of firmness: The majority of online mattress companies we reviewed only offer one level of firmness for its mattresses. Saatva differentiates itself by offering three, which many Saatva mattress reviews emphasize as being a major help in finding the perfect firmness. Delivery time: Saatva mattresses are made to order, which means they can take a bit longer to arrive than competitors. Delivery time varies depending on your location but typically takes between five and twenty days. If you’re needing a new mattress immediately, you might not want to wait such a long period of time. Heavy: Mattresses aren’t light, but Saatva is particularly heavy. A queen-sized Saatva mattress weighs nearly 120 pounds! Thus, if you find yourself redecorating or moving often, you may be deterred by Saatva’s weight. Less-competitive warranties: Trial and warranty are shorter than some competitors. The Saatva mattress is engineered for comfort and perfect for couples who share a bed. The magic of this mattress starts with the coils. 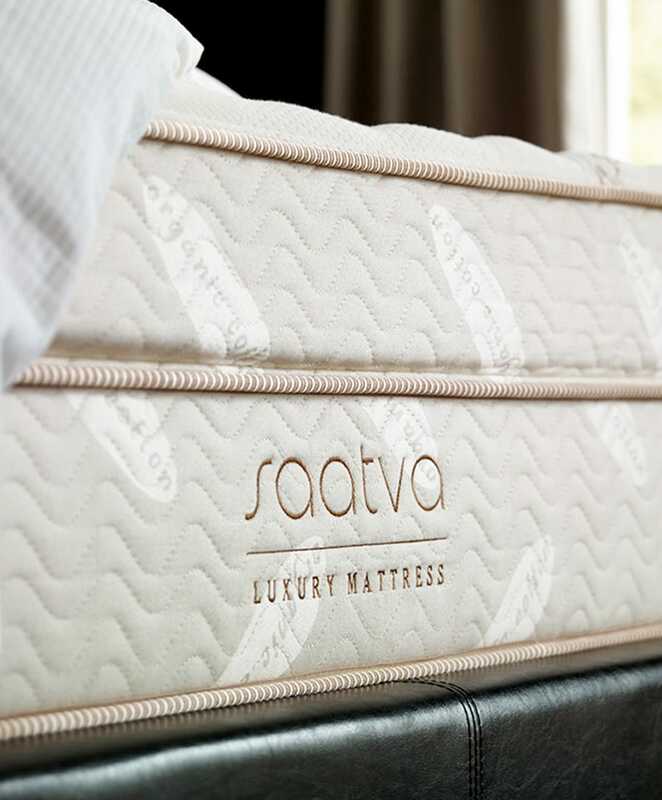 Saavta is made from individually wrapped coils in the top portion of the mattress contour to the shape of your body. Also, a tempered steel support lower coil base helps to prevent sagging issues you might see in other mattresses. The foam in the mattress makes a big difference. The mattress also has a foam encased, anti-sag edge support to ensure better durability and more sleep surface. High-quality memory foam reduces pressure and tension on the lower back, providing optimal lumbar support. The top layer is all about comfort. The Euro pillowtop offers more cushioning than most regular pillowtop mattresses. This layer also has a special fabric called Guardin. It helps prevent bacteria and keeps the organic cotton clean for longer. You’ll still need to clean your mattress, but the antibacterial materials in the bed will help you know you’re in a clean bed. The Saatva Plus Soft Mattress is the softest of Saatva’s offerings and geared for those who like to feel their mattress hug them. This mattress is perfect for side sleepers or those who have trouble with their arms falling asleep. 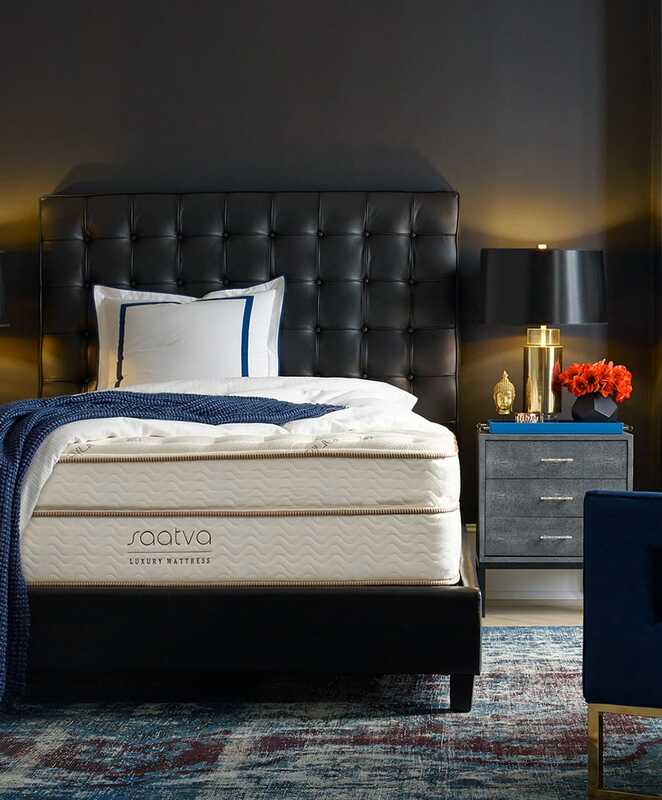 Saatva’s Luxury Firm Mattress brands itself the perfect Goldilocks bed — neither too firm or too soft. The most popular of Saatva’s offerings, this mattress is the perfect blend for those who enjoy a firm yet plush mattress. It’s perfect for all types of sleepers, whether you sleep on your side, back or stomach. Saatva’s Firm Mattress is perfect for sleepers who prefer a firm mattress. When you lie down upon this option, you’ll sink into an initial level of plushness but immediately feel the firm support your body craves. This mattress is perfect for those who like to sleep on their back or stomach. This mattress also the best option for those with joint pain or bad backs. Saatva mattresses differentiate themselves from the competition by offering a variety of firmness. The mattresses come in three different levels of comfort: plush soft, luxury firm (the company’s flagship-level mattress) and firm. If you’re not sure which you need, consider reading Saatva mattress reviews to see if you can find people with similar needs and which mattress they chose. You can also choose from two different heights: 11.5 inches or 14.5 inches. There is no difference in price for the height variations. Twin Mattress: Saatva’s smallest mattress, the twin, measures 38 in. x 75 in. x 11.5 or 14.5 in. Twin XL Mattress: Saatva’s twin XL is slightly longer than the classic twin and measures 38 in. x 80 in. x 11.5 or 14.5 in. Full Mattress: Saatva’s full mattress measures 54 in. x 75 in. x 11.5 or 14.5 in. Queen Mattress: Saatva’s queen measures 60 in. x 80 in. x 11.5 or 14.5 in. King Mattress: Saatva’s king mattress measures 76 in. x 80 in. x 11.5 or 14.5 in. California King Mattress: The largest of Saatva’s mattresses is the California king, which measures 72 in. x 84 in. x 11.5 or 14.5 in. Saatva beds are manufactured to order, and delivery times vary based on your location. For example, if shipping to Los Angeles, your delivery window is 5-12 days. A New York City delivery window would be 5-12 days as well, but an Atlanta delivery is 9-18 days. Saatva’s online customer service chatbot can walk you through the delivery process and give you a quote based on your zip code. Some Saatva mattress reviews mention how it came quicker than expected, however, while other reviews say that the wait was difficult. Saatva offers free white glove delivery. This means the company’s delivery team will unbox the mattress and bring it into your desired room. The delivery team will handle all assembly and setup. If you have an old mattress you’d like to get rid of, Saatva will remove the mattress and dispose of it for you. One thing we want to highlight in our Saatva mattress review is the financial option. Mattresses are expensive, but thankfully, Saatva allows for financing. If you’d prefer to use a financing option rather than put the full charge on your credit or debit card, Saatva has partnered with financing company Klarna. Klarna allows you to spread your payment out over months (or even years) with low APR offers. Mattresses are a big investment, so it’s nice to have the option to pay it off in installments. Many people look for warranty and trial information in a Saatva mattress review. Learn more about their warranty policy if this is important to you. Saatva uses the highest quality of materials, but everyone knows that mattresses aren’t meant to last forever. As such, Saatva offers a 15-year warranty. During the first two years of your mattress’s life, Saatva will replace your mattress with a brand new Saatva mattress free of charge if the mattress is deemed defective. After the two-year mark, Saatva will repair any issues with the mattress, including recovering it if necessary. You will have to pay $99 in transportation costs each way, but the repairs are free. If you’re nervous about ordering a mattress online, don’t be. Similar to other online mattress retailers, Saatva has a generous return policy. You have 120 days from the date of your delivery to make your decision. If you don’t like the mattress, Saatva will pick it up and refund you. Saatva constructs an adjustable base called the Lineal Base that can be paired with its mattresses. 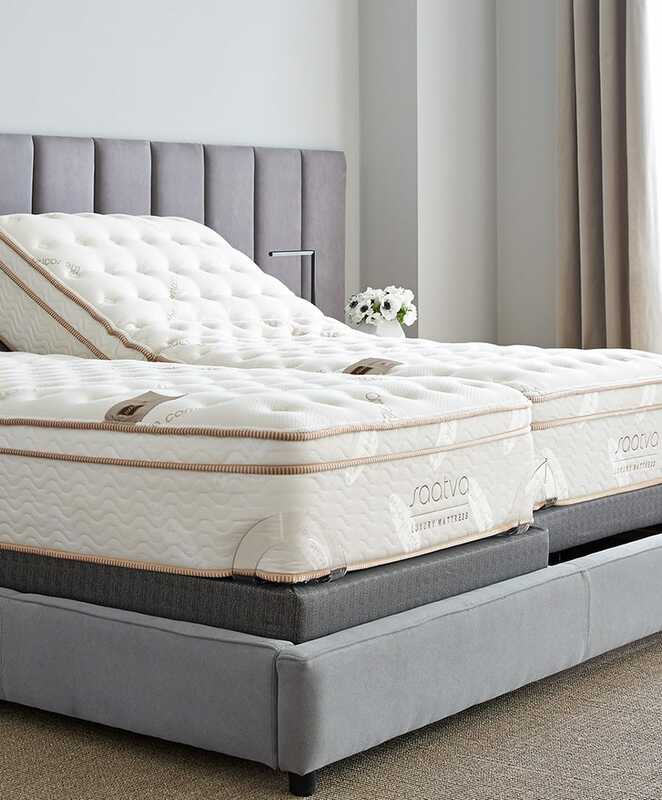 The base allows you to move your mattress into varying positions including up, down and flat. This way, your mattress is always perfect for your needs whether you are sleeping, reading or working. The Lineal Base also offers under-bed illumination so you can create a lighted path should you wake in the middle of the night and need to find your way to the bathroom. Settings can be programmed and customized as well. Need more? The base can also act as a masseuse! It offers three speeds and can provide head, leg or full-body massages. It also comes with a 25-year warranty. After doing our full Saavta mattress review, we at Top5 love this mattress. Yes, it’s expensive, but it’s worth it. We love the customizable firmness options and are more than happy with its 15-year warranty and 120-night sleep trial. While these warranties may not be as extensive as competitors, we feel that 120 days is more than enough time to fall in love with (or hate) a new mattress. We also love that the mattress stays cool, thanks to its air ventilation system. Finally, Saatva’s free white glove delivery sets them apart from the competition. While most mattress companies offer some sort of white glove delivery, most come with a fee. If you’re interested in learning more about this mattress, read more Saavta mattress reviews on their website. Is Saavta your mattress? Leave your own Saavta mattress review below!